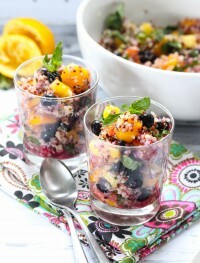 Are you in love with quinoa as much as I am? 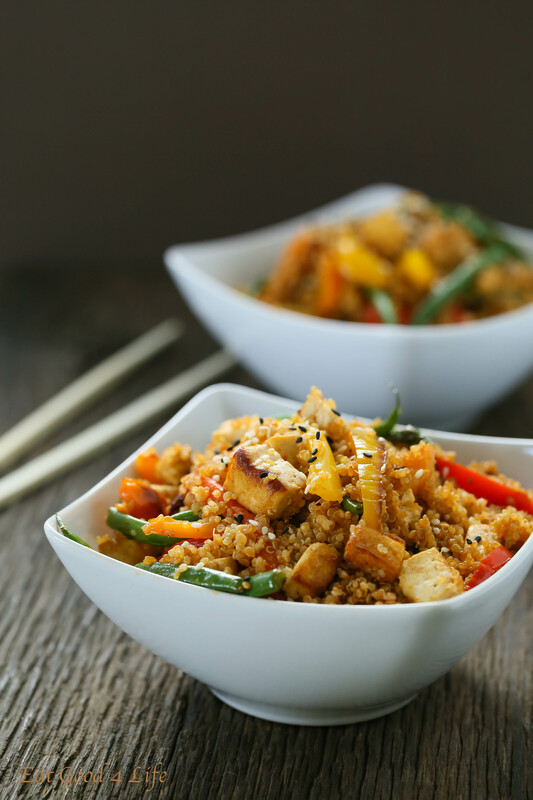 I love using quinoa when ever possible and for this dirty Thai fried quinoa that is what I did exactly. 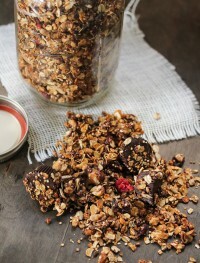 I loved how easy and healthy this recipe is too. Brown rice and quinoa are one of my favorite whole foods to use when I cook. Granted I also love to use pasta but I like to have a variety in my cooking. I came up with this vegetarian dirty Thai fried quinoa version after doing some research. I loved to have a variation without the chicken liver or beef liver since that is what this recipe actually calls for. No chicken or beef liver for me thank you! 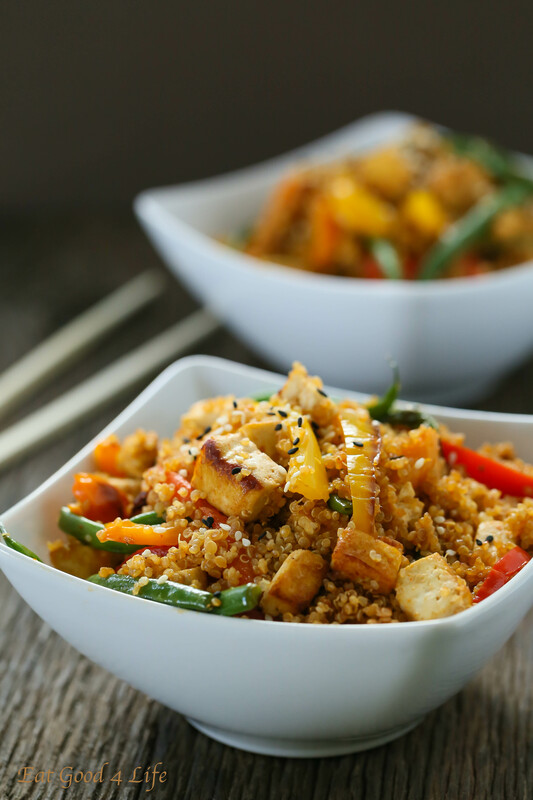 While you can use those ingredients if you like, I think my vegetarian dirty Thai fried quinoa version turned darn good! 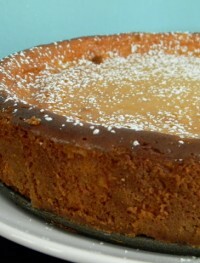 I actually made this recipe a couple of times. The first time I kept the same amount of sauce ingredients as the recipe calls for but the second time around I actually used more of the soy sauce and red Thai paste which turned the recipe spicier. I made it for a friends gathering so I wanted to have some more kick to it. Needless to say the recipe was a total success and well liked by everyone! You can also use any other veggies of your choice. While I used different colored peppers and green beans you can also use fresh kale, fresh spinach, fresh broccoli, onions, carrots…the sky is the limit. 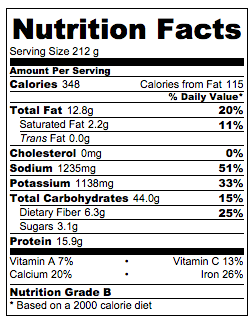 You can even use some cubed chicken breast for the protein of choice if you like. Well, I hope you guys get to make this amazing, super easy, delicious recipe. Next time I make it I will double the batch so that I can freeze it. 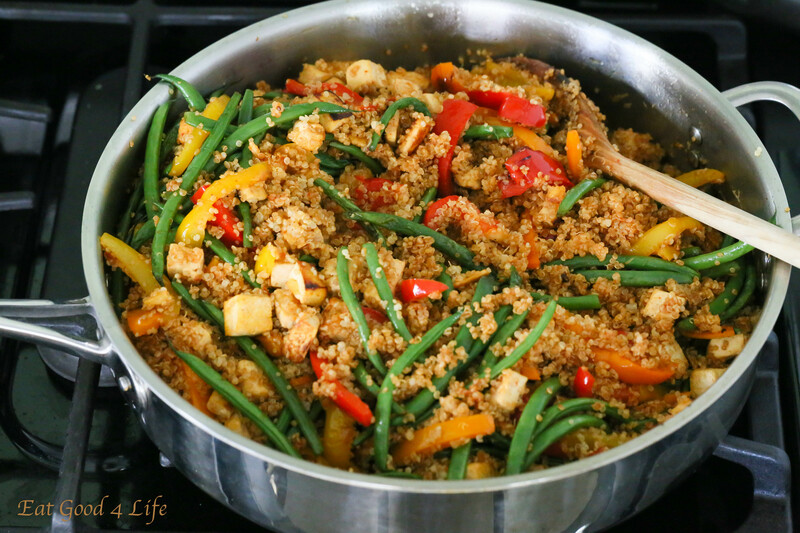 In a large skillet, over medium to high heat, add all the ingredients except the cooked quinoa and sauce ingredients. 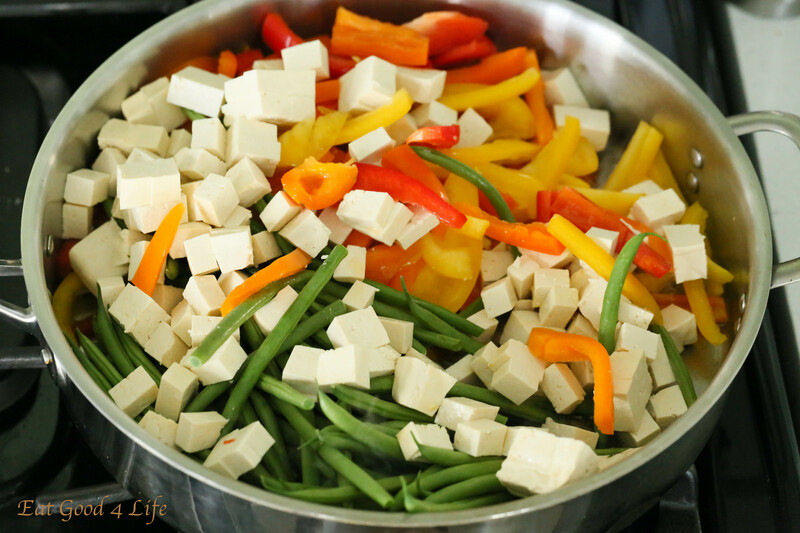 Cook tofu/veggie mixture for 5-8 minutes until tender stirring occasionally. On the meantime, in a small bowl mix the sauce ingredients. Set aside. 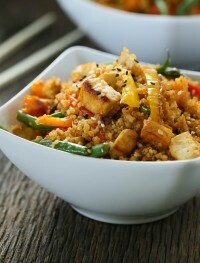 When the tofu/veggie mixture is almost tender add the quinoa and sauce mixture to the skillet. Mix through and cook further for another minute or so stirring constantly. Turn heat off and serve immediately. You may sprinkle some pepper flakes and sesame seeds if desired before serving. NOTE: If you feel you don't have enough sauce you can increase the amount. I do that sometimes but when my kids are eating it I don't since it may be too spicy for them. These are absolutely stunning! I’ve never cooked with tamari before but I will have to go searching for it! 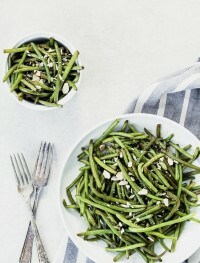 I love green beans, they are one of my favorite! These tamari flavored ones sound incredible! Love the idea of combining green beans and tamari! Sounds delicious! Love the flavor combo in this dish. pinning! I love green beans. And I like that you used tamari for this! Sounds delicious! Thanks for sharing! Ooh, these look so good! 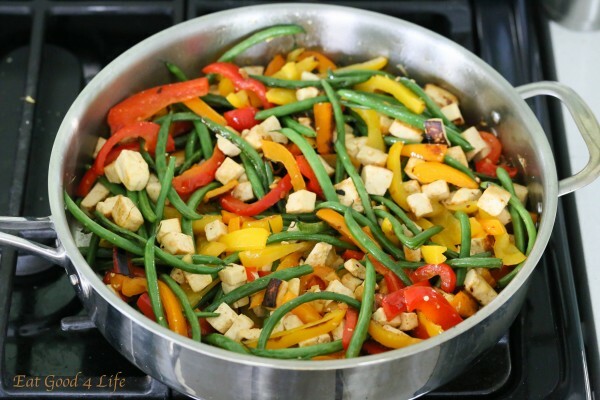 I love green beans!